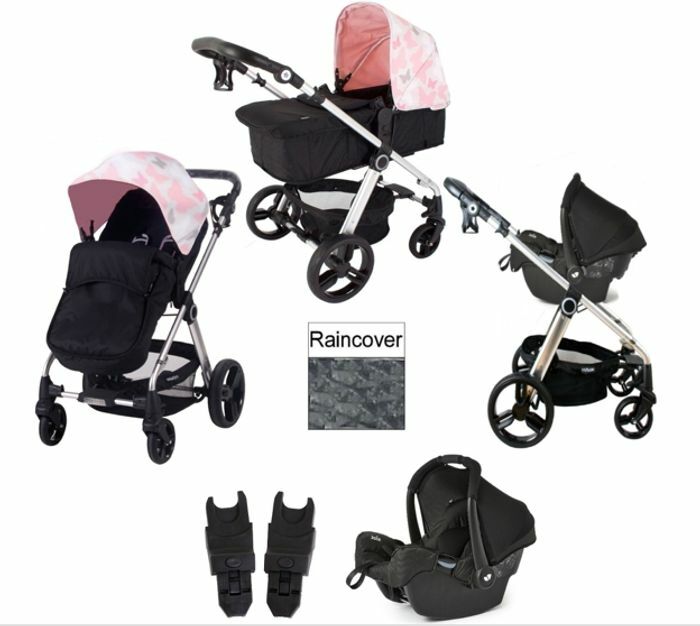 With a super-stylish metallic-look frame, the MB150 from My Babiie is conveniently a travel system and pushchair in one! Suitable from birth, the MB150 generally starts out in ‘pram mode’ which offers your newborn the ability to lie completely flat (recommended by health care professionals) when strolling. The padded insert is soft and cosy and it also comes with a cover to keep your little one snug and warm. The bassinet / pram easily transforms into a regular pushchair seat unit when required, and can be positioned to be either forward facing or parent facing depending on your preference. As the extendable 3 position canopy is the only colour on the pushchair, you can easily change up your style (or coordinate with your outfit) by purchasing additional hoods which are available separately. The included Joie Gemm Group 0+ Car Seat features a 5-point safety harness which keeps the torso positioned safely in the middle of the seat at all times and the (removable) newborn pillow provides a perfectly snug fit for younger / smaller babies. Conveniently attaching to your pushchair with the use of the Maxi Cosi adapters (included) the Gemm allows you to transform your buggy into an awesome travel system. In regards to fitting the car seat in your vehicle, the Gemm can use the standard adult safety belt, or with use of one of Joie’s bases (sold separately) guaranteeing an easy and secure fit every time. *Stack* Price for Karcher Pressure Washer!!! !